SAN MARCOS (3-18-16) – Grossmont College’s 13-game baseball win streak and unbeaten conference run came to an end on Thursday (March 17) when the Griffins, who lead the Pacific Coast Athletic Conference by themselves, were upset by five-time defending champion Palomar 10-6. MICHAEL DIFFLEY homered for Grossmont (14-6, 7-1 in the PCAC), while ANDRES RIOS went 2-for-4 with three RBIs and TRAVOR BEARD was 2-for-3 with a double and two runs scored. But it wasn’t enough to avoid an upset as the Comets got to six G-House pitchers for 16 hits. The Griffs fell behind early 5-0 but demonstrated they have no quit in them as they battled back to close the gap to 5-3 and 7-5 and, after Palomar scored three runs in the seventh inning to lead 10-5, again mounted a comeback in the top of the eighth. But the Comets’ fifth pitcher of the afternoon, preseason community college All-American Taylor Turski who is coming out of the bullpen as he heals from a minor injury, came on with none out and runners at first and second and closed the door on the Griffins with a flyball out and two strikeouts. Turski then retired Grossmont with a 1-2-3 ninth inning to notch the save. For Grossmont, ROBERT BOSTEDT, TAYLOR PERRY, NOAH STROHL, JUSTEN BURKEY and JUSTIN MITCHELL also hit safely. Grossmont got to five Palomar pitchers for 10 hits. The Griffins were coming off a 1-0 victory over the Comets on Tuesday at Noel Mickelsen Field when winning pitcher ALAN STRONG and two relievers threw a combined three-hitter at the visitors. In that game, the two teams managed to combine for only eight hits. On Thursday, they combined to knock out 26 hits. 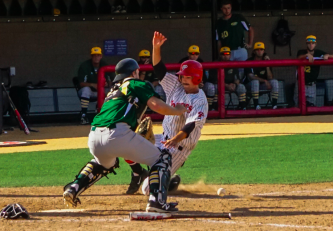 Grossmont and Palomar will close out their three-game series on Saturday (Mar. 19) at 12 noon back at Noel Mickelsen Field. Henderson,Casey doubled to right field, RBI; Breault,Dylan scored. Wezniak,Matt singled to center field, RBI; Henderson,Casey scored. Grant,Chase singled to left field, RBI; Benson,Mike advanced to second; Wezniak,Matt scored. Henderson,Casey doubled to left field, RBI; Holm,Niko scored. McKean,Kyle singled to right field, advanced to second on an error by rf; Olson,Shane scored, unearned. M. Diffley homered to left field, RBI. T. Perry reached first on an error by 3b, advanced to second; R. Bostedt scored, unearned. N. Strohl singled to center field, RBI; T. Perry scored, unearned. Gallagher,Mitch doubled to center field, 2 RBI; Grant,Chase scored; Benson,Mike scored. A. Rios doubled to center field, 2 RBI; J. Mitchell scored; T. Beard scored. Holm,Niko singled, bunt, RBI, advanced to second; Breault,Dylan advanced to third, scored on a throwing error by p; Gallagher,Mitch scored. Henderson,Casey singled to left field, RBI; Holm,Niko scored. A. Rios singled to left field, RBI; J. Mitchell advanced to second; T. Beard scored, unearned.